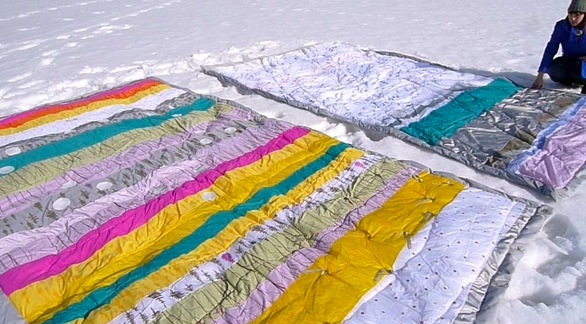 Using the latest in e-textiles and soft circuits, the quilts sense the presence of people [and] environmental conditions and react to these through a multitude of small gestures and transformations. But they are first and foremost quilts: assembled one piece of fabric after the other and providing natural warmth and comfort when needed. Andreos’ art making extends the meaning of “home” to include our planet, its weather and environment. She turns notions of private comfort into a publicly shared experience. These quilts are flags to the melding of tradition with new mediums of expression. I salute them! You can check out Andreos’ e-quilt project at missmoun.com. Image courtesy from missmoun.com.